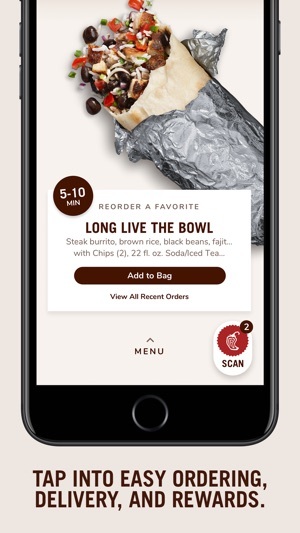 Like a tiny Chipotle that lives in your phone, our app lets you order real, delicious food for pickup or delivery & earn points toward FREE Chipotle with Chipotle Rewards. In a word: Rewards. 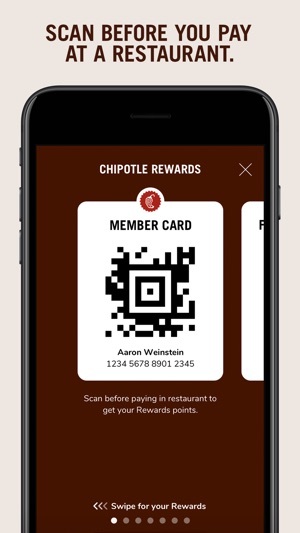 In more words: the deliciously-rewarding, points-for-eating-Chipotle experience you’ve been dreaming of (and asking for). That’s right, we finally did it. And now, our real food becomes real free, real fast. 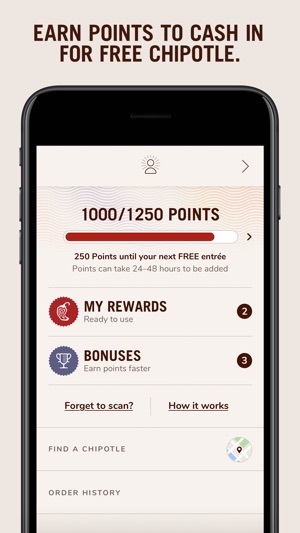 Earn points automatically for app orders, or by tapping the scan button and scanning your Rewards code before you pay in person. Oh yeah, and enrolling is easy. 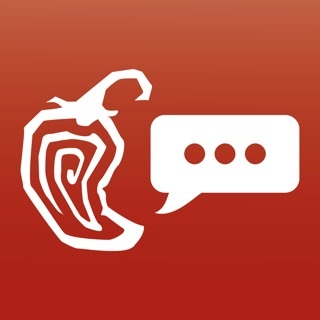 Just create a Chipotle account or tap JOIN NOW in the app if you’ve already got one. Next stop, Rewards. This app would not let me move on until I selected one of 3 ways for The App (not me) to select which location I want IT to chose. None of the 3 are how I want to place an order. I would prefer to manually select a store each time because if I’m picking up I am out for work and may want to pick up either close to a location I will be, close to my office or home. None of the 3 options will let me do this. AND mark my words I guarantee I will place an order, glance over it and miss something because I’m in a hurry and the order will be sent to a store I did not intend (because I have done this before on similar apps). I know that’s ultimately my fault but it wouldn’t happen if I could manually select the store location I want. Also the app should tell us if the location is out of something or the team should have a way to update it to remove options they don’t have. I order crunchy tacos only to get there and discover their fryer was down and had to make a different choice. Clearly not the end of the world but i didn’t find out until I went up to the counter to pick up so obviously the order wasn’t ready, the point of the app is to save time when I’m in a hurry and if that can happen it would have been faster for me to just go through the line and place an order the regular way. That way it easy to say light salsa too. This is just negligence on Chipotle's part. I have ordered through your app 4 times since delivery became an option. Each time something was left out of my order. I have contacted the store that made the food each time this has happened. Each time they have claimed to be out of a certain item, I have asked why they didn't call me to ask if the substitutions they made were okay (some have not been because I have dietary restrictions). None of the employees I've spoken to, including shift managers and even the GM have been unable to explain why they are chronically out of items, why they leave items out of orders even when they are not out of stock, and why the employees in charge of making my order are incapable of calling me to make sure the substitutions they have to make are okay. The store I'm referring to is a Restauranteur store in Ellisville, MO. Having worked for an RT store myself, I know the standards they are supposed to be held to. The constant problems with making orders correctly and management's inability to supervise the store in a way that prevents constantly running out of food are not acceptable and are definitely not being addressed, as no improvements have been made for delivery customers. Feedback to the store has fallen on deaf ears. As such, I will no longer be a patron of this store, possibly of chipotle as a whole. The app just doesn’t seem to want you to use gift cards. There has been a problem for weeks of it not showing any gift card balance, which support told me was going to be fixed. Still not fixed. The bigger issue for me is that I can’t load multiple gift cards. 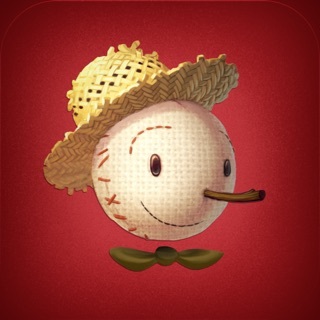 I LOVE Chipotle, so family and friends often give me gift cards for birthdays or Christmas. But when I have a $5 balance on a card thru the app (when it was actually working! ), I can’t load another gift card to get it high enough to actually make the purchase, and there is no ability to split the payment between the gift card balance and credit card. 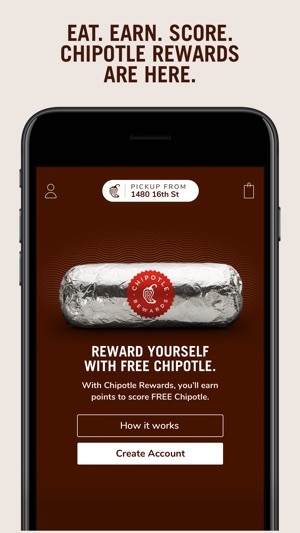 The “response” to this is to use the small gift card balance toward a purchase in store...which makes the app pretty pointless! If I can only make 50% of the orders I would like to via the app, and the app itself is apparently unreliable, what is the point of the app? It is not a tall task to add the capability to load multiple gift cards or split the payment between a gift card and credit card (in fact I think the early versions of the app HAD that ability), so why is this still not a thing? 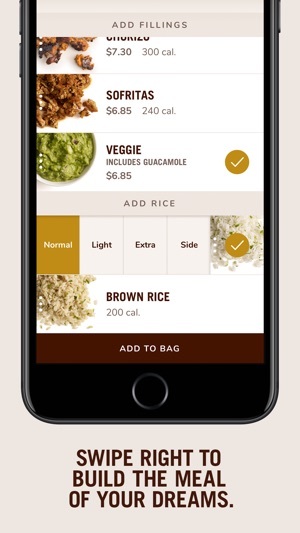 I will eat Chipotle either way, but the point of the app is the convenience, and I find the continued neglect of the payment portion of the app supremely disappointing.